Visit Mountains Plus Outdoor Gear online at Store.MPgear.com for all your outdoor gear from respected brand names like Atlas Snowshoes, Chrome Messenger Bags, Big Agnes Tents and Sleeping Bags, Crescent Moon Snowshoes, Camelbak packs, DEAN Bikes, Pronghorn Bikes, SRAM Components, Extrasport Paddle Equipment, Osprey Backpacks, Gregory Backpacks, Sierra Designs Tents and Sleeping Bags, Princeton Tec Lights, Brunton Compasses, Suunto Compasses, St. Moritz Watches, Inov 8 Trail Running Shoes and Packs, Ultimate Direction Packs, Primus Stoves, MSR Tents, Snowshoes, Stoves and many more. Save on your next purchase from Store.MPgear.com with Store.MPgear.com discounts, Store.MPgear.com coupons and Store.MPgear.com savings from 58coupons.com. Save 20% on Chrome Messenger Bags from Mountain Plus when you use this code at checkout. Click link to get started. 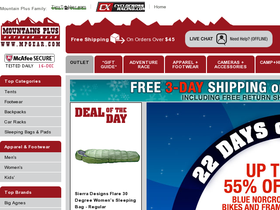 Enjoy free shipping on orders over $45 from Mountains Plus Outdoor Gear. Click link to start shopping. For a limited time only save 15% store wide with this coupon code from Mountains Plus Outdoor Gear. Click link to shop. Save 10% store wide from MPgear.com with this coupon code. Click link to start saving. Check out the outlet items at MPGear.com and save up to 60%. Click link to view. For a limited time get a free foot print (over $30 value) with any tent purchase from MPGear.com. Click link to view. Get a second reservoir for free with purchase of Raptor or Manta Osprey Hydrolics Pack from Mountain Plus. Follow this link to get started. Get on over to Mountains Plus Outdoor Gear to purchase INOV-8 shoes and receive a free pair of socks (valued over $10). Click link now to score. Buy any Big Agnes Men's or Women's Sleeping Bag and receive a Big Agnes Iron Mountain Pad for free. Click link for details.